Is the Bible, like Christ, both human and divine? By Rachel Held Evans, on June 25, 2012. As I’ve been reading through Peter Enns’ Inspiration and Incarnation, I’ve been struck by just how perfect it is for our series on learning to love the Bible for what it is, not what we want it to be. Enns, an Old Testament scholar, has an approachable, lively writing style that makes his books informative and easy to discuss, but what I love best about Enns’ work is that each page betrays a rigorous commitment to preserving both intellectual integrity and faith. I’ve had the privilege of meeting and talking with Enns, (so hopefully I’ll be able to include an interview in the series), and he is one of a handful of scholars and mentors who has helped me realize that much of my anxiety surrounding my reading of Scripture has to do with the expectations I place upon it. He has consistently challenged me to accept the Bible on its own terms, honoring it for what it is, not what I think it would be. Enns’ committment is evident in these words from the books’ preface: “I believe with all my heart that honesty with oneself is a central component to spiritual growth. God honors our honest questions. He is not surprised by them, nor is he ashamed to be our God when we pose them...Being a part of God’s family is ultimately a gift to us, not something to be obtained by us. God has freed us in Christ and made us his children. And, as all children do, we ask a lot of questions.” (p. 10) Anyone who has read Evolving in Monkey Town will know how profoundly these words resonate with me. 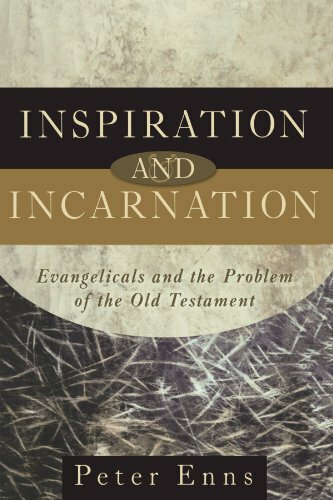 Inspiration and Incarnation focuses on three specific problems/questions raised by the modern study of the Old Testament and uses those specific problems/questions to engage in a broader conversation about the nature of Scripture, to “provide a theological paradigm for people who know instinctively that the Bible is God’s word, but for whom reading the Bible has already become a serious theological problem—perhaps even a crisis.” The book is divided into five chapters, so we’ll take on one chapter per Monday, for the next five weeks. Let’s begin with Chapter 1, in which Enns lays out the purpose and scope for the book and introduces an important metaphor for understanding the nature of Scripture. Enns begins with the assumption that “the Bible is ultimately from God and that it is God’s gift to the church.” However, modern study of the Old Testament has reinforced the fact that the worldview of the biblical authors affected what they thought and wrote, and so it is necessary to take the worldviews of the biblical authors into consideration when we interpret the text. According to Enns, many evangelicals have assumed a defensive posture when it comes to confronting the linguistic, historical, and archeological evidence that shows the Bible to be “firmly situated in the ancient world in which it was produced,” for fear that such “situatedness” detracts from its divine nature. This need not be. Rather than ignoring or lamenting the evidence, Enns suggests we allow it to teach us something about how the Bible ought to be read and interpreted. Enns hopes that by exploring these issues and questions , we can elevate the conversation by allowing them to challenge us on a more fundamental level. “What is needed is a way of thinking about Scripture where these kinds of issues are addressed from a very different perspective,” he writes, “where these kinds of problems cease from being problems and become windows that open up new ways of understanding” (16-17). Here Enns introduces a controversial and intriguing analogy to help us understand the nature of Scripture: As Christ is both God and human, so is the Bible. Examples of these human marks include the fact that the Bible was written in Hebrew and Greek, that the Old Testament world was a world of temples, priests and sacrifice, that Israel as well as the surrounding nations has prophets that mediated divine will to them, that Israel was ruled by kings, that Israel’s legal system shares striking similarities with those of surrounding nations, that the creation narrative and the story of Noah resemble other ancient stories of the time, that the writers of Scripture operated within the paradigm of ancient cosmology, etc. With this analogy in mind, Enns moves on to apply it to the first of three Old Testament “problems”—the Old Testament and Ancient Near Eastern Literature—which will be the subject of next week’s discussion. I find the incarnational analogy imperfect, but incredibly helpful when it comes to managing...(in fact, challenging)... my expectations regarding Scripture. What about you? Does the metaphor resonate or totally break down? How have your ideas regarding the nature of Scripture evolved through the years?